While browsing through a few backlinks today I came across an interesting article I had left a comment on a few months back, the article was titled “How Long Should It Take To Get Onto The First Page of Google?”. This is a very interesting question because as any SEO can relate, we’re flooded with questions like this on a daily basis. Answers like these are difficult to answer without proper research as each industry is different. We also have to factor in that the top 10 websites for any given query will never be the same. So to give a firm answer to what it would take to rank on the first page of Google, in this post I’ll point out basic metrics and factors to consider in order to give you a solid foundation into ranking on the all desirable first page of Google. 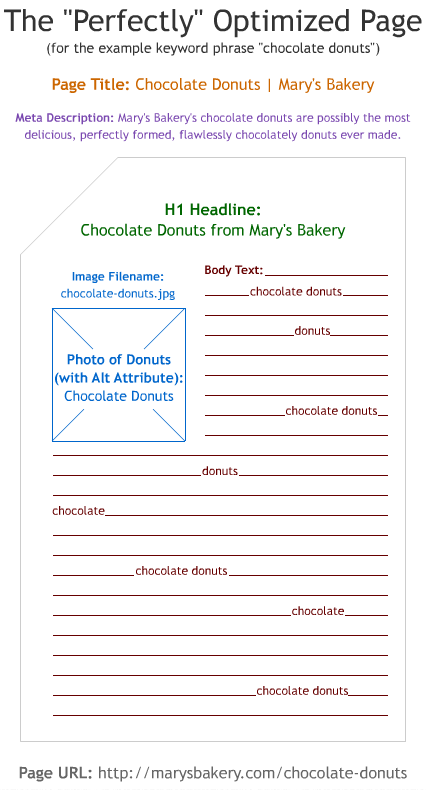 Starting with on-page factors. Without strong on-page signals, search engines will have a hard time understanding what your page is about. If search engines don’t understand what you specialise in or what you’re trying to rank for, your website will most likely never reach the first page. As a general starting point, all the concepts mentioned above should be completed to the best of your ability. A website enforcing these concepts will always have a greater chance in ranking on the first page of Google compared to a website which doesn’t. For savy SEOs, I recommend using Moz’s on-page grader to analyse on-page factors. For everyone else who can’t afford pro membership, SEO Worker’s on-page analyser is a good free approach. I know most SEOs will argue that the number of backlinks doesn’t directly relate to first page Google rankings, and to be perfectly honest, it doesn’t. However, noting down competition backlink figures certainly is a good starting point into determining how hard your road to first page is going to be. To determine how many backlinks your website has, I recommend using Ahrefs. To start things off by navigating your way to the Ahrefs homepage and enter your website into the command field. Once entered hit the try it for free button. Upon seeing the results you’ll come across a page which will display numerous graphs and figures. We’ll just concentrate on the top two graphs to determine the number of backlinks and referring domains. For the purposes of this guide, I’ll be using www.carsales.com.au as an example. Below is a representation of Carsales’ total amount of backlinks along with the total amount of referring domains. Collect these figures and have them noted down. Conduct a few more analysis for all top ranking competitors and compare all results to see who comes out on top. This should then paint a clear picture of which sites have more links and ultimately, how many you’ll be aiming to acquire in order to stand at chance at moving up the SERPs. For a more in-depth look at how to build links post-Penguin, read my article on the 5 most important factors to link building. Never sacrifice quantity over quality. While quantity is important, as time goes by we’re continually learning that Google is enforcing the importance of incorporating a vast amount of high-quality and relevant backlinks. Penguin 2.0 is proof of this is, and it certainly isn’t going to get any easier as time goes by. 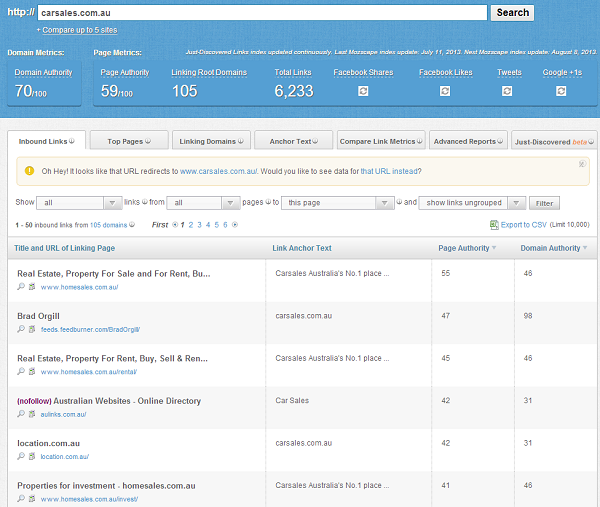 To check the quality of backlinks from your competitors, simply conduct an analysis via Open Site Explorer. Take a few of the top ranking websites for your chosen keyword and enter them into the command bar. You’ll be presented with an entire backlink list. To view the data install the MozBar as well as WebRank SEO toolbar. Scan through as many backlinks as possible until you’ve received a general idea of the types of links they’re attracting and building. Consistent analysis practice will increase your rate of quality backlink awareness. Now that you understand what it takes, it’s time to form a strategy. Have your on-page optimisation complete and work to build a solid link building strategy that will propel you to first page rankings!